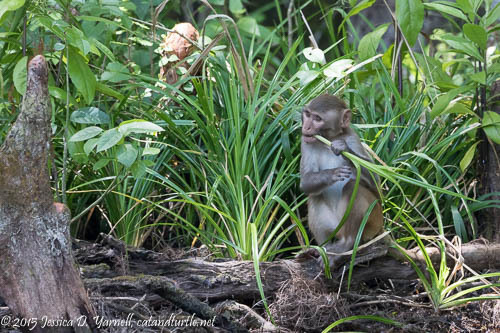 Blog > Beyond the Backyard > Silver Springs > Hey, Hey, We Found the Silver Springs Monkeys! Hey, Hey, We Found the Silver Springs Monkeys! 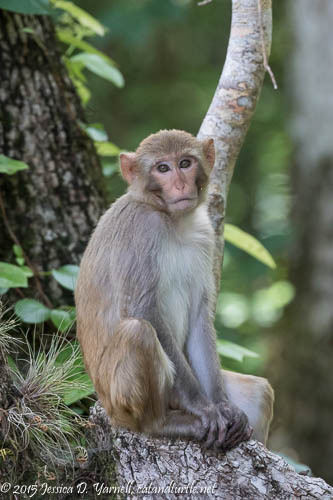 At the beginning of the Silver Springs monkey cruise that I wrote about in my last post, I asked Michael if we were going to photograph monkeys or be the monkeys. I figured that if we couldn’t find any of the monkeys that can sometimes be seen along the Silver River, we could have fun doing some silly-photographer selfies. Then as the morning went on, it didn’t look like we were going to find any monkeys. 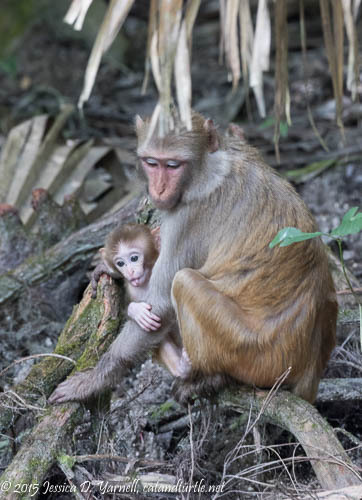 Until the last hour of our boat ride, when we first found a lone sentry monkey, then a whole group of them…and my favorite was the baby!! 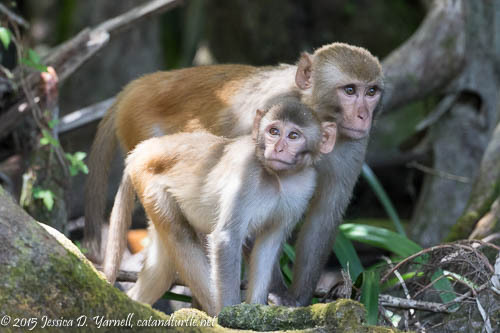 We found a group of about 20 monkeys cavorting along the side of the river. They hopped, ran, jumped, and called to each other. They were such fun to watch! They were bigger than I expected. Their features were so animated. It wasn’t long before I spotted my favorite pair of monkeys. 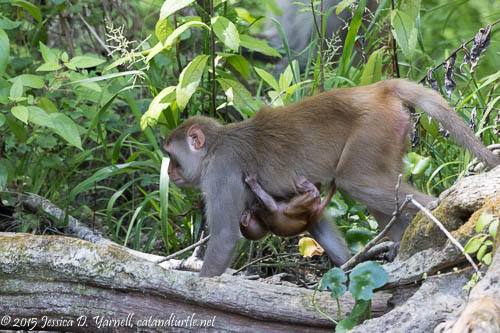 A mom had a pretty small baby that she carried with her. He was just precious. 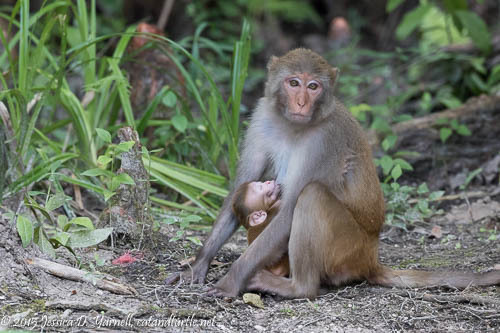 Mom and Baby – Look at his Tongue!! This pair was very mobile. Baby would just hitch a ride on Mom whenever she decided to pick up and move. She did that rather often. These monkeys were all over the place!! They were a challenge to photograph, especially from a moving boat, with other tourists in between us, and shooting into the dark shadows (without flash). Boy could they climb! They ran up and down the trees as easily as my cat Whiskey climbs his cat shelves. Actually these monkeys reminded me a lot of my silly cats. They both leap well! 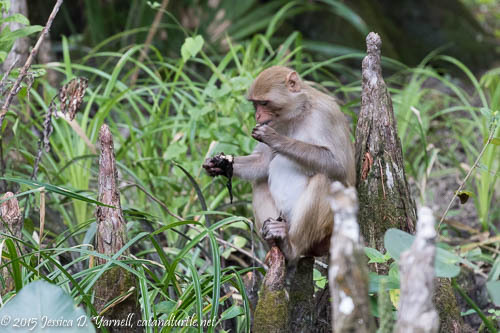 It was lunch time, and this monkey grabbed a long piece of green vegetation to eat. He looks like he’s playing the flute! 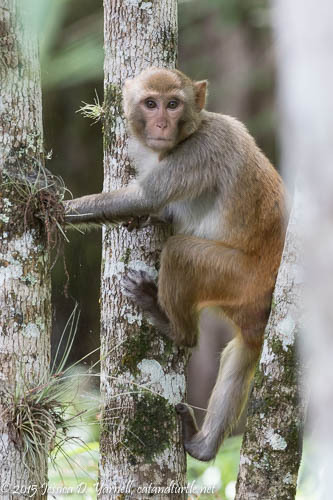 Nearby, another monkey hopped onto a cypress tree knee and settled down to eat…a nice muddy something! It looked pretty gross to me, but he seemed to enjoy it. 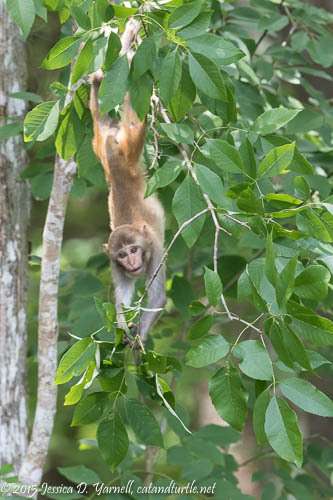 This monkey ventured out onto a long branch and then tried to figure out how to jump up to the next branch. It must be nice to have finger-like digits on all four feet – it helps with the climbing! 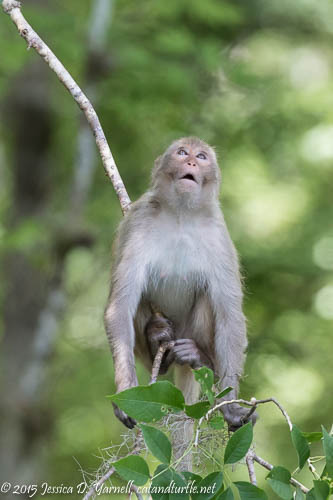 This one did the opposite – he held on with his feet as he dropped down to grab a leaf from the tree branch below him. These monkeys are born gymnasts! Some kayakers got so close that the monkeys almost jumped into their boats. 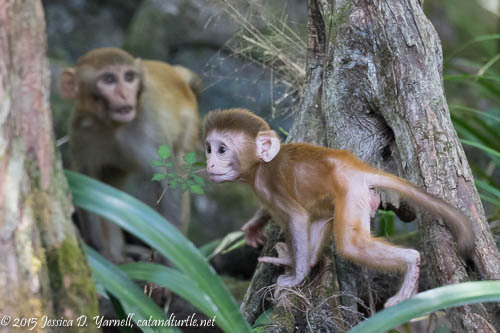 As cute as the monkeys can look at times, they are wild animals and they do bite. 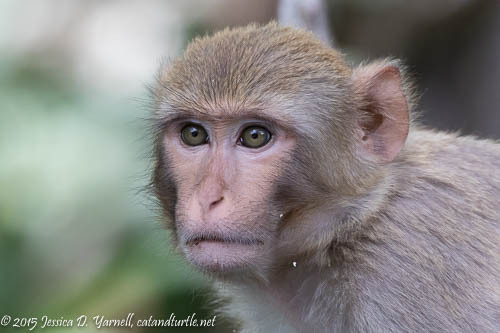 I had my 500mm lens with me, so I was able to get head shots of the monkeys on the near shore. That’s as close as I wanted to get! 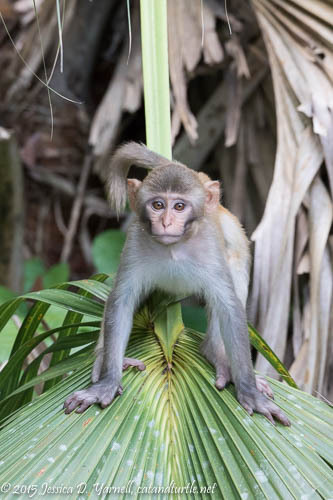 This monkey especially reminded me of my cats as he balanced carefully on a palm tree branch, with his tail held high over his head, ready to pounce. 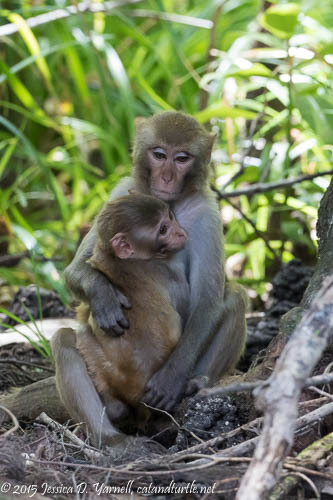 This little monkey ran up to Mom for a quick hug. The human-like expressions of these animals was fun to capture! Then they ran off together as we put our cameras away and headed back to the dock. It was almost 1pm and we didn’t feel like sharing the monkey’s lunch of grass and muddy mystery meat! How fun!!! That must have been a blast. 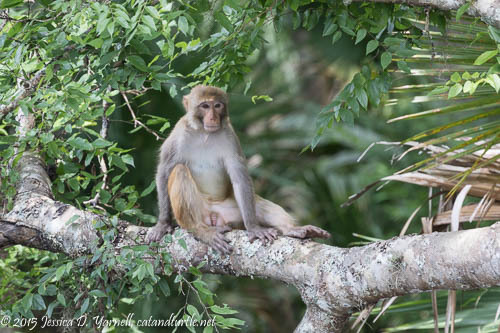 I remember years ago going to see the wild monkeys of Dania. I was a bit afraid of them too… Awesome shots Jess! What a fun morning. You got some great shots. Next time I’m sitting in the front of the boat so that I get the great opportunities! Great images Jess and great write up as well!